Wales kicked off their autumn campaign with a convincing 19-5 victory over South Africa at the Arms Park. Rowland Phillips' side crossed for three tries in total with Jasmine Joyce, Sioned Harries and Carys Phillips all crossing while Robyn Wilkins kicked four points. All South Africa could muster was one try courtesy of Lusanda Dumke. "The way the girls defended was satisfying, but the frustration was that we left a lot of opportunities on the pitch," he said. Captain Carys Phillips agreed: “"We didn't make the most of our opportunities, but to get a first win of the autumn against a big team like that is great." The home sides forward set the platform for their first try with the likes of Phillips and Sioned Harries making the hard yards. A feature of the game was the power of the Welsh pack. 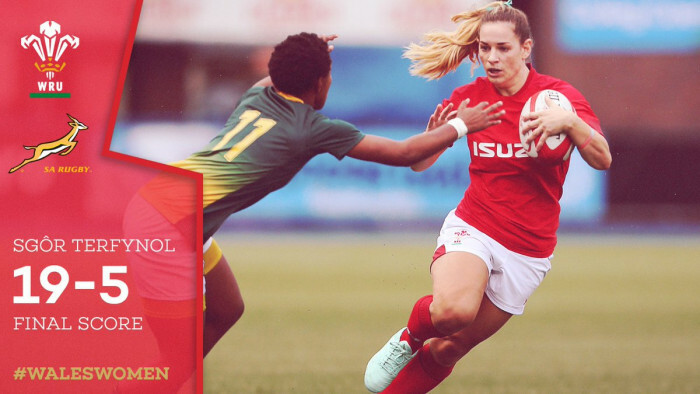 “"We've got (forwards coach) Hugh Gustafson in this year and the scrum worked well and put us on the front foot.”, said Carys Phillips and that was clear from early in the game when they shunted South Africa backwards in the scrum with powerful No 8 Harries dragging three defenders with her over the line to extend Wales' lead. Wilkins successfully converted meaning the home side turned around 12-0 to the good at half-time. "Especially when we were down to 14 [after Harries' yellow-card]], the defensive shift was outstanding, so was Robyn Wilkins at 10, who put in a big game”, said the captain. There was a 10 minute break in play after Wales star Kerin Lake was stretchered from the field after a collision of heads. But the good news is that she recovered quickly after being taken off on a stretcher following a clash of heads, to the relief of team-mate Jess Kavanagh. "I got a bit worried about her, it's not nice seeing anyone being injured like that, so all the best to Kerin. "A win's a win, but I want to give a shout out to all the forwards, they played amazingly. "South Africa kept fighting, but our defence structure has worked really well." Wales now face two of their 2017 Rugby World Cup opponents, Hong Kong, whom they beat 39-15, and Canada, who beat Wales twice at that tournament, 15-0 and 52-0. "Hong Kong play fast, they want to get it in and out of the scrums and play with high tempo, while Canada are quite similar to South Africa, running straight with a physical approach, but a lot more experience," Rowland Phillips told BBC Sport Wales. "Two different challenges, but that's what makes the autumn series exciting. "We'll assess our injuries, but there will be changes (against Hong Kong) as I need to know which players can cope with the intensity of international rugby."